Ingredients: Isododecane, Trimethylsiloxysilicate, Cyclopentasiloxane, Kaolin, Dimethicone, Hydrogenated Polyisobutene, Synthetic Beeswax, Silica Dimethyl Silylate, Flavor (Aroma), Tocopheryl Acetate, Ethylhexyl Methoxycinnamate, Disteardimonium Hectorite, Propylene Carbonate. May Contain [+/-]: Titanium Dioxide CI 77891, Red 7 Lake CI 15850:1, Red 6 CI 15850, Red 30 Lake CI 73360, Red 28 Lake CI 45410:2. VEGAN/CRUELTY-FREE. 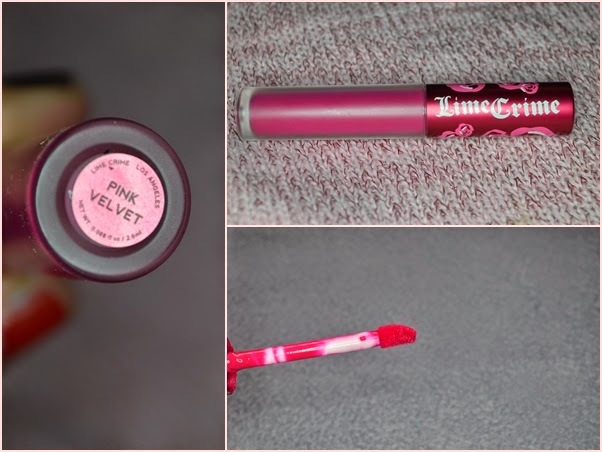 Just like the two other Lime Crime velvetines, Pink Velvet is also in a thick, see-through glass tube and you can really see the color. I kind of like this type of packaging because I don't have to check the lid and I can easily see what product I'm getting. Another thing,the brush is shorter compared to the other two velvetines. The brush easily fits the contours of my lips which makes application much easier. It is a very vibrant dark pink color.It is very opaque. and pigmented. I do admit that it can be tricky at first but once you get the hang of it, application is super easy. One swipe is enough but if you want to layer it some more, you have to wait a few seconds until it is dry then you can apply the next layer. Like the previous ones, it is glossy at first but becomes completely matte after a few seconds. Do note that it is a little difficult to remove. In my case I use a wetwipe with a little bit of makeup remover or petroleum jelly to thoroughly erase the product from my lips. 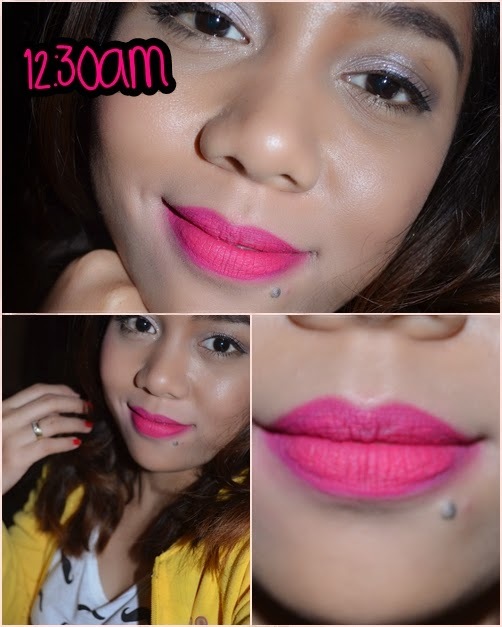 Since it is very matte, it can be drying and does settle on the lines of the lips. Applying a thin layer of lip balm lessens the dryness without affecting the longevity and color pay off of the product. It is very flattering on most skin tones. At first, I was a little hesitant to wear it because it seems too loud for me bur after awhile, I felt comfortable and it has never left my "kikay" kit ever since I first used it. One thing that I love the most about Velvetines is their lasting power! I mean..it is just amazing!It can last me for more than 6 hours. I can drink water and eat a sandwich without worrying that it will come off. I do notice that when I eat something oily, a little bit comes off. I don't eat at work though, I just drink water and I can be working for 4 hours to 8 hours straight without retouching and it does not come off. I don't have any problems with peeling either I would not say that it looks exactly the same though because the inner parts of my mouth do look a little bit lighter as compared to the edges. Here are the other shades of Velvetines that I have.You can read my previous post to see more swatches and read my thoughts about them. Well, it is a little bit pricey than other lipsticks but I really don't mind because I get something that is very opaque and long-lasting. It is quite difficult to get them though, because they are always sold out on the website but there are other online stores on Facebook and Instagram that re-sell them. YES! It it is truly worth the price. Thank you for reading my post. I hope you enjoyed it! Here is my video swatch and review of the three velvetines that I have! Wow, this looks gorgeous on you! these colours are so prettty and the staying power is really impressive. omg! i really want these in suedeberry!! the lasting power is superb! !